ENO HouseFly Rain Tarp. Part rain tarp, part luxurious, water-proof fortress, the HouseFly's silicone impregnated nylon sides keep you warm, dry and comfortble. Overlapping doors complete with agile buckles on either end of the tarp make access an ease while keeping out winter's nastiness. 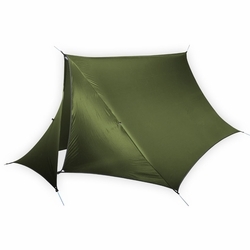 Boasting the most coverage of all the ENO tarps, the HouseFly's stowable doors allow you to laze in cool shade or weather a surprise snow storm. From a five day trek in the backcountry, to a five minute nap in your yard, the HouseFly will give you home-style comfort in any condition. Eagles Nest Outfitters.